Rosy has totally gotten the hang of the beach. She is great at chasing balls on the sand while I go out in the ocean to fetch. However, the other day at the beach, she did something that I did not teach her. She ran into the ocean and stole my ball! Bad Rosy! I always thought pool was an interesting game. You hit balls with sticks, but not like baseball. So when Rosy and I were watching some people play pool it got me to thinking. 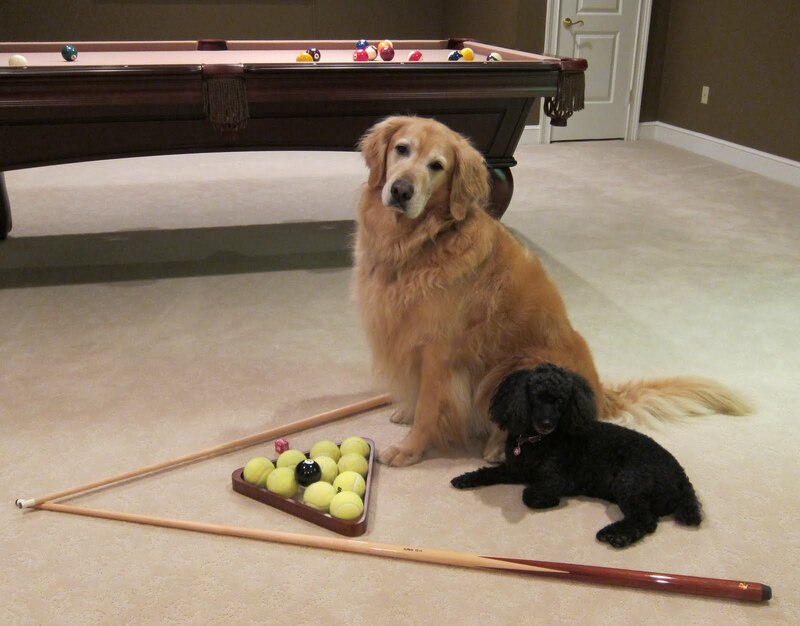 Do you have to use pool balls? Why not tennis balls? You can still use an eight ball to make it authentic. Now I just have to figure out how to use the stick without thumbs. A new activity since I have been home is walking a bit over a mile to Powerhouse Park. Then we sit on the grass (the benches are usually taken) and watch the sunset. At first I wasn't sure why I should watch a sunset, especially since it made me blink a lot. But then as I watched I realized it is a perfect time to meditate and reflect on the beauty of the earth. And since it is around dinnertime, sunset also makes me think of pizza since it is round and similar coloring. 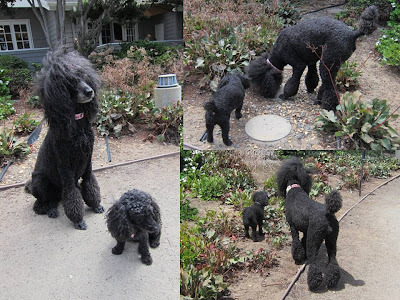 We have new neighbors, black and white standard poodles, Sadie and Hannah. 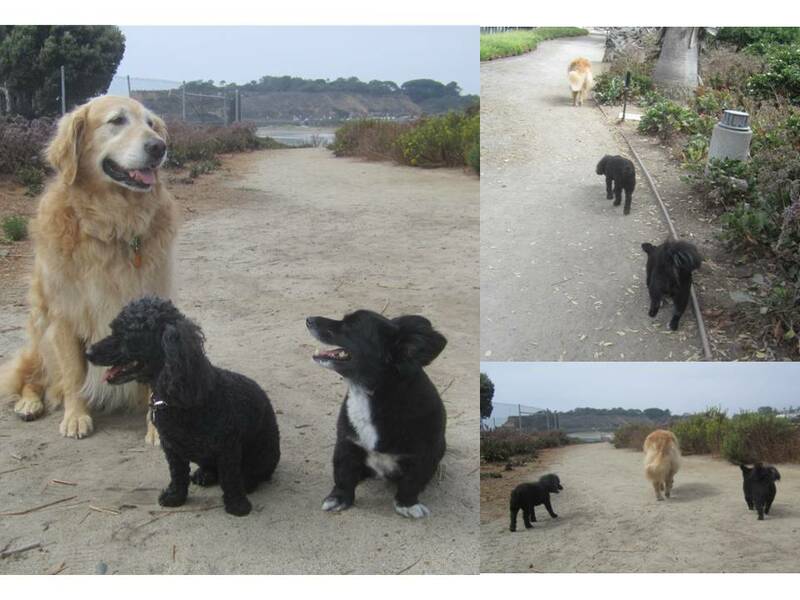 When Sadie saw Rosy she barked "mini-me !" Rosy freaked a bit and let her know who is boss. Rosy told Sadie that she is not "mini-me." She said that Sadie is "Maxi-me". Yesterday we all went to the beach. 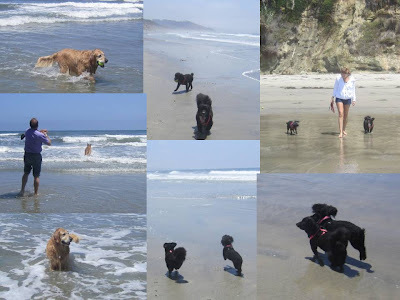 We went to a part of the beach that we secretly got to go off leash! Dad played fetch with me while my sis Sydne stayed with the little girls while they played. Mom of course was playing photographer. When I think about my life now in San Diego, I think I need to celebrate Thanksgiving early. 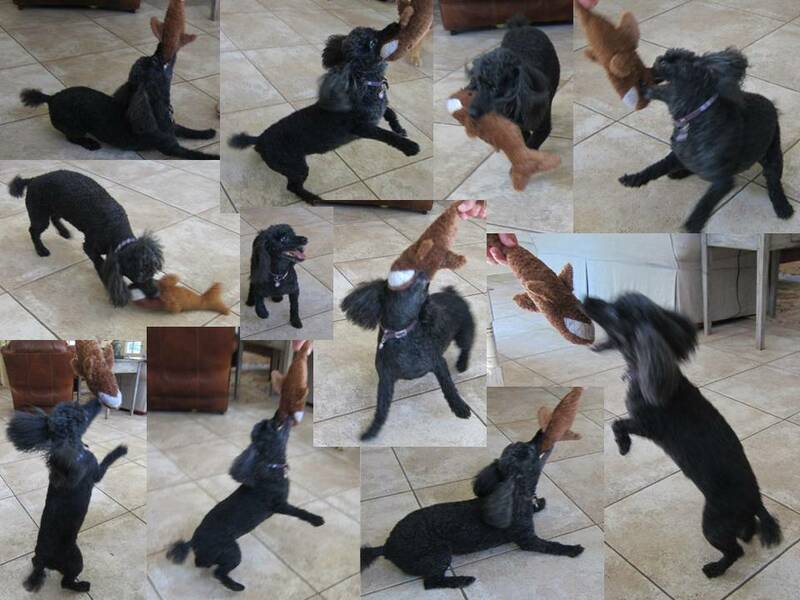 Bunnybell came to visit (with my human sis Sydne). It is so nice being together with BunnyBell in San Diego. This time though, Rosy is here too. So now I have two little girls to watch out for. So I take them on walks and I feel like the Bear Piper. And then we stop and rest and they get to ask me questions. Since we haven't seen each other in awhile, BunnyBell had so many things on her mind. I feel so important being a big brother and an Uncle. I am so happy to be home in San Diego. There is just one problem. No dogs are allowed on a major portion of my beach during the summer. We can go on either side of it on leash, but if the tides are high, there is hardly any beach. So we have to wait until after Labor Day to take our long beach walks. So now all I can do is go to the park and visit my beach from afar. Of course Rosy and I do try to sneak off leash in the water when no one can see! I hope we don't get sent to juvedog hall. Rosy loves the beach. But she doesnt like her face feeling wet. So she tried to dry off by rolling in the sand. Wrong move Rosy. She ended up being a big sandy mess. She was even too sandy for a bath! So Dad took her by the water to dunk her to get the sand off. She wasnt sure about that, so I came to help. That made her feel better. I really need to spend time showing her the ropes at the beach. I was half asleep when I thought I saw a sign saying Welcome to California. Then I heard Beach Boys songs playing on the radio. I thought my ears were playing tricks on me or I was California dreamin'. Then Mom opened the window and told me to look. I don't like to get up while we are moving so I sniffed the air. Hmmm...it smells like ocean? When the car stopped I got out. There it was. My house! It was all there! Just like when I left! YES! I'm back home in San Diego! So ya know what I did next don't you? BEACH! As our road trip continued we drove from New Mexico to Arizona and saw really pretty scenery. 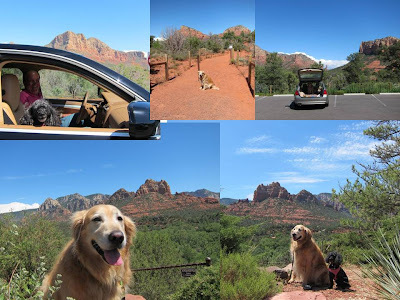 We stopped for lunch and pics in Sedona, Mom's favorite place. Then we arrived at the wonderful Firesky Resort in Scottsdale just in time for cocktail hour. They gave Rosy and I each a Bosco Beer. Bosco, a cocker spaniel, is the Director of Pet Relations at the hotel. Can you believe he has his own beer label? Cool. So we enjoyed our beer and then had room service bring chicken strips for dinner. If it wasn't so hot, I could get used to Arizona life. 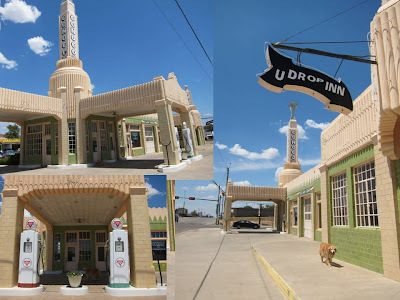 On the third day of our trip when driving through Texas, Mom wanted to stop and see more landmarks on Route 66. Of course, I obliged with photo shoots. One was the Tower Conoco station with the U-Drop Inn Cafe. You can't get gas or food anymore, just info and souvenirs. Cool art deco building. (Looks a bit like the one in Disney's film Cars). Then we came to Cadillac Ranch. It was a bunch of Cadillacs upside down in the ground! Way cool. I could have had fun and added my name with spray paint, but Mom said no. So much for getting my kicks on Route 66. We set out back on the road on Day two of our trip. Mom was insistent on going to see a big blue whale. So I figured we must be going to the ocean! 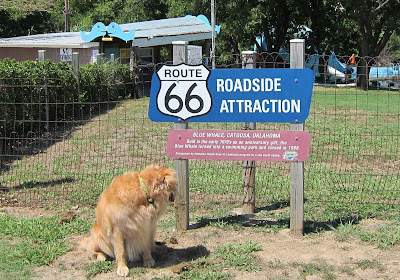 Then I saw the sign for Route 66 - that's where the Cars were in the Disney movie! We drove into the town of Catoosa, Oklahoma and then I saw it. A big blue whale! We got out (even though it was over 100 degrees) and walked into the whale. Now I know how Pinocchio felt! We set off on our long road trip yesterday. I was laying down on my bed in the back of Mom's car while Rosy has a booster seat bed in the front seat of Dad's car. 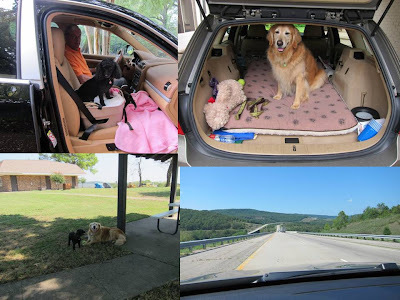 We drove on a big highway and every few hours stopped at a Rest Area. At the first rest area we didn't rest, we all went to the bathroom . But at the second rest area I felt I should follow directions, so I did rest even though I wasnt tired. Ok, so I am not thrilled with this driving thing. How many ways can I say BORING? But I was excited when I got to our destination in Bella Vista, Arkansas and got to see my Aunt Kathy!And, I got to meet my Aunt's friend Kay. She is one of my loyal blog followers and came over just to meet me! Well now I know for sure that we are going on a road trip to our new home. Tomorrow is the first day of the trip. Mom still won't tell me where I am going. She said we will be driving for just under a week and making different stops . 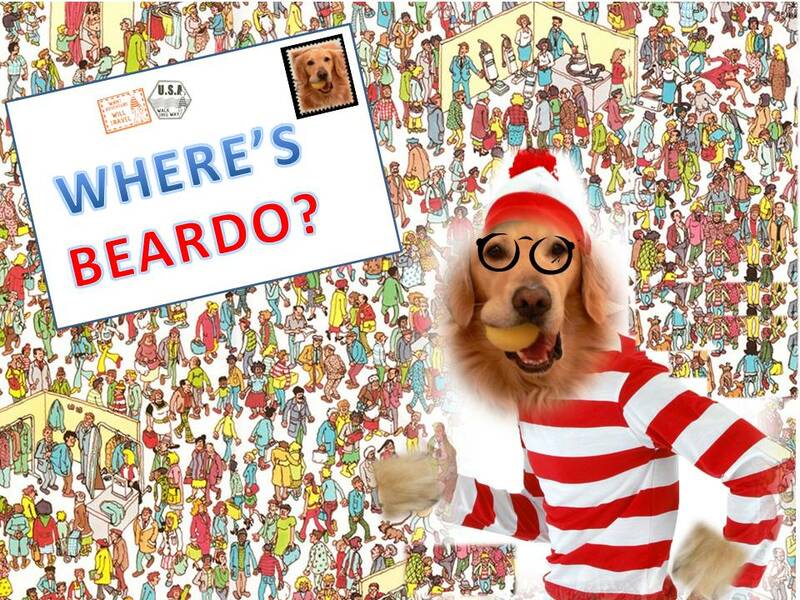 This reminds me of Where's Waldo. Except now I don't know where I will be! So I guess that could be a new adventure... Where's Beardo! You are welcome to play along. The trucks came to start taking everything away. I was watching the movers to make sure they didn't take any of my stuff by mistake. Then I went over to look at the trucks to make sure that nothing was in there that shouldn't be. So I looked and there was Rosy sitting in the truck! I asked her what she was doing. She said she thought it was time to go. I explained to her that she doesn't go in the truck. Boy am I glad I checked! 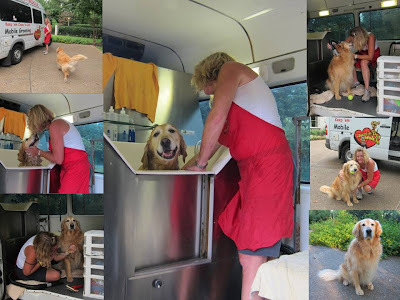 Mom and Dad said we are going visiting so I needed to have a spa day. So yesterday the spa mobile came. I got to jump in the bath. Jennifer, my spa therapist, gave me a massage with my shampoo. Then she did my blow dry. She said I didn't need highlights cause I had them naturally. So I got my fur trimmed and styled. I even had a fur pedicure. Still not sure where I am going, but now I will look and smell good when I get there. So I found a good side to this move. Mom and Dad took us to the store to stock up on treats for the trip. I was too busy sniffing around and looking at the kitties, birds and hamsters to notice what was going in the shopping cart. But when I got home, I couldn't believe all the treats! Wait a second, how long is it going to take to get to my new home? Mom says that we can't take all of our toys with us when we move. She said we can pick out the toys we want to keep and put them in the basket. All the others we will donate to pups that would really appreciate them. So Rosy and I spent a long time discussing what we should keep. It was hard for her because she is a hoarder. It was hard for me cause each toy has sentimental value. We finally came to our decision and the basket was filled. Luckily, I get a separate basket with my tennis balls. 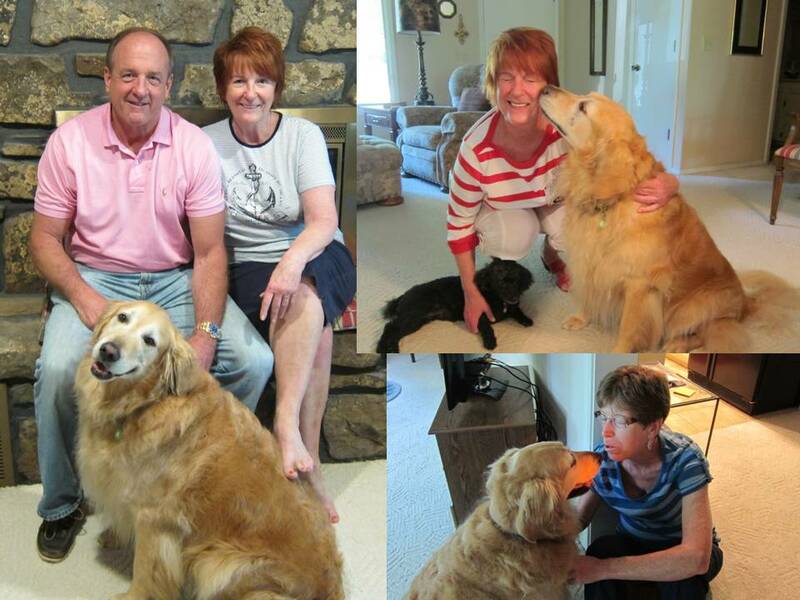 Mom and Dad have been spending a lot of time packing stuff into boxes. Mom said that some of it we are taking with us, and other stuff will be sold or donated. So I have been trying to keep a careful eye on what is being packed. Yesterday I fell asleep during the packing. When I woke up I looked over at all the boxes. Oh no! There was my ball with all the boxes! Luckily, I was able to get that ball. I need to be more diligent in my watch. Maybe I will ask Rosy to take a shift. I usually like surprises, but where I am moving to is not one of them. Mom still wont tell me. And Dad won't because Mom said no. So I thought I would try to figure it out, or at least narrow it down. She said I will be happy so it really could be anywhere. I narrowed it down to the U.S. since Mom hasn't bought any travel books like she does when she goes internationally. But boy do I live in a big country. Where could we be going? There has been a sign in front of our house for a little while but I didn't pay much attention to it. But then I noticed another sign that says "SOLD". I asked Mom why we sold our lawn. 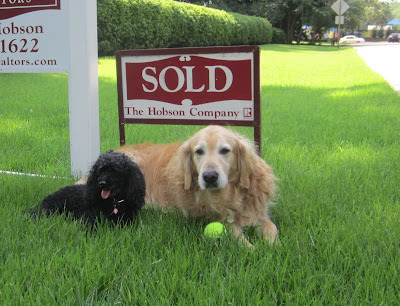 She explained that it meant that we sold our house and we will be moving. Huh? Mom said that while it may sound like bad news that we will be leaving our wonderful house, there is good news as to where we will be going. She won't tell me where though, cause she wants it to be a surprise. OK. So I am officially freaked out. Yesterday I got to go into the Botanic Garden for Dog Days of Summer! 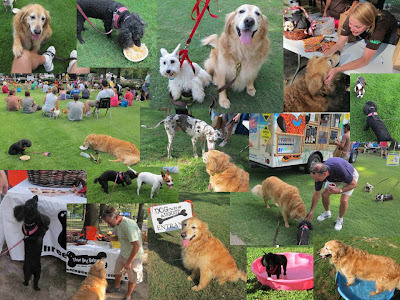 It was a special event just for dogs (well, we were allowed to bring our humans since they had the entrance fee money.) Anyway, it was really fun! First we went to all the tents and got samples (Rosy' s favorite part). Then I thought I saw a mirage since it was so hot, but I got to go into these pools to cool off. After, Dad got us some beef bullion flavored ice cones. We ate them while watching the contests. Can you believe Mom didn't enter me into the costume contest?! 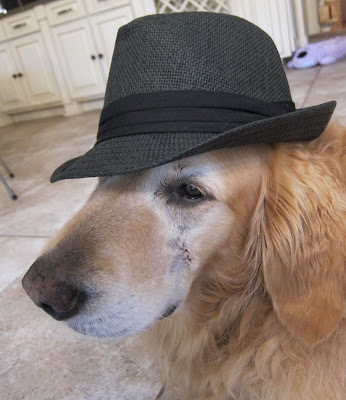 My lab friend Cocoa Puff suggested while I have my scar, I could be a gangster and make all the girls swoon. So I found my gangster hat. Cocoa Puff was right about the girls. I keep on getting these messages from girls flirting with me and wanting to be my girlfriend. Why do so many girls like bad boys? Well, I am not bad. And I am only a gangster until my scar heals. And I don't want a girlfriend. After all, I am Mama's boy. With all the weddings, proposals and bridal showers in the news, Rosy keeps thinking about what it must be like to be a bride. So she put on a wedding veil and walked around to see a pretty place to get married. She chose a nice spot near the flowers. Then she asked me to sit in for her potential groom. 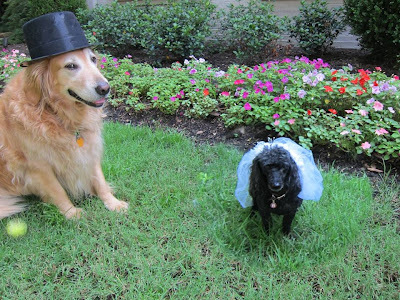 I don't know why she thinks she's getting married. I, as her big brother, won't even let her date! The other day I went to the vet to get my teeth cleaned. Well, no problems with my teeth, but I had a thing on my face which the vet wanted to take off and get tested. Luckily, it was nothing. However, before I had this very discreet pimple looking thing under my fur. Now I look like Scarface. But don't worry. 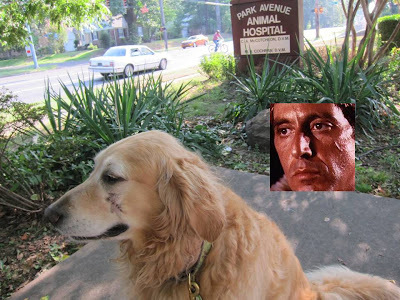 I am a nice Scarface and a law-abiding dog. Yesterday Mom took out a Frosty Paws box from the freezer. I was very excited, but Rosy was skeptical. She had never heard of them. She asked why she would want to eat someone's paws? 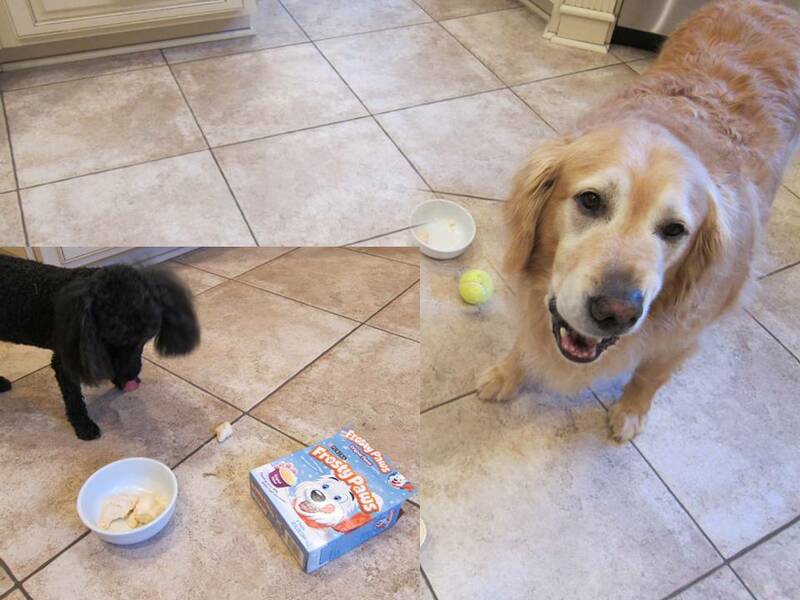 I explained that it was a delicious ice cream for dogs. So she tasted it and thought it was good. But she thought it was much too cold to eat. So she took some out of her bowl and decided to wait until it got warm to eat it. How can she not understand the concept of ice cream? 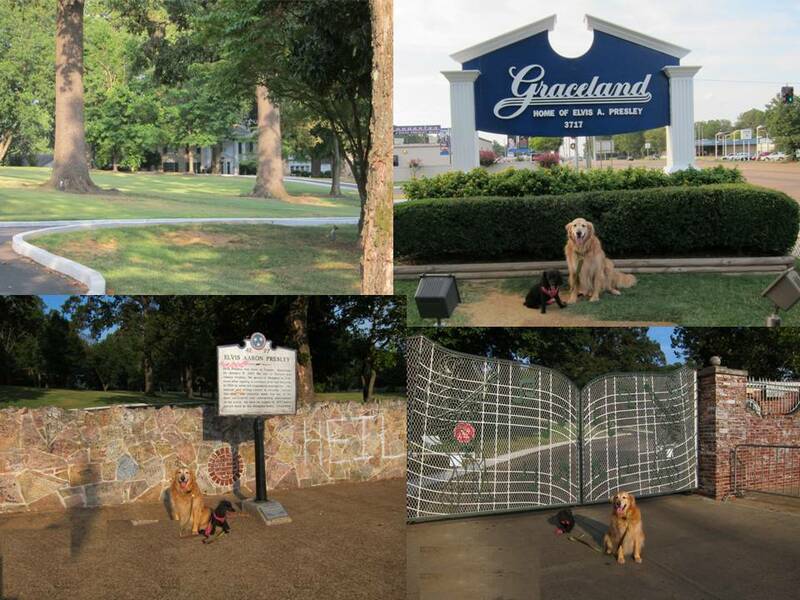 I finally got to go to Graceland, Elvis's home. Well, I went to the outside of Graceland, cause as I aint nothin but a (hound) dog. But I did get to see the gates and the wall and the planes and from far away the mansion. So I guess that is more than I usually get to see. Maybe that's because I often hum Let me be your (Teddy) Bear. I told Rosy it was Shark Week so we need to have respect for sharks. But she doesn't listen to me. She went right over to her shark and started attacking it. She thinks her shark should have respect for her. I don't think the shark is going to win this one. Poor shark. Well, The Bachelorette is over tonight. 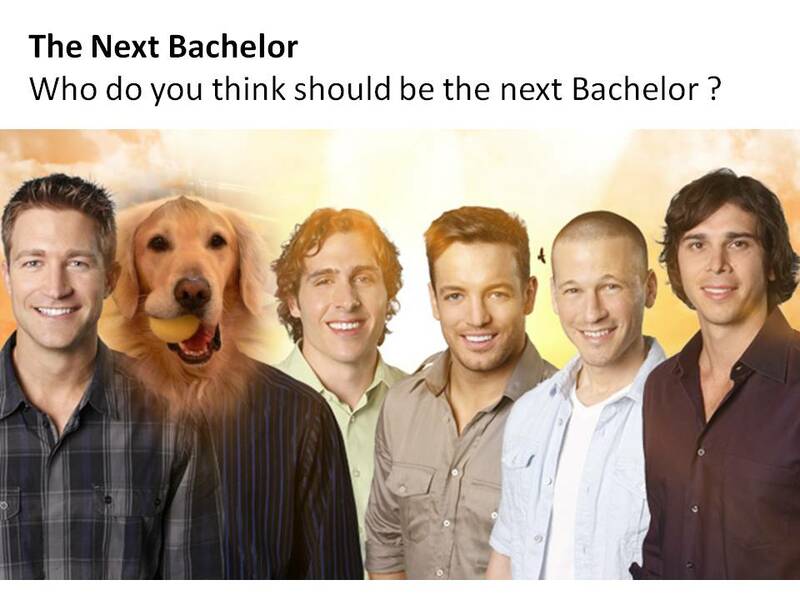 ABC has already posed the question on their website as to who the next Bachelor should be. I read the comments. Some say it should be someone from the current Bachelorette (lots of Ames votes). Others suggest someone new. Well that got me to thinking. Why not me? It would definitely refresh the show and likely bring a whole new audience. So I thought I would put my name in with the contenders. 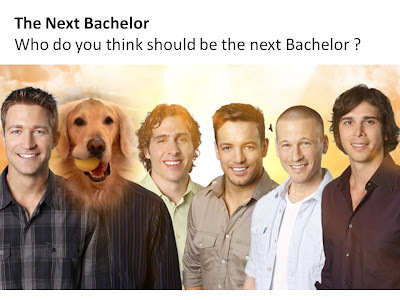 Who do you think should be the next Bachelor?